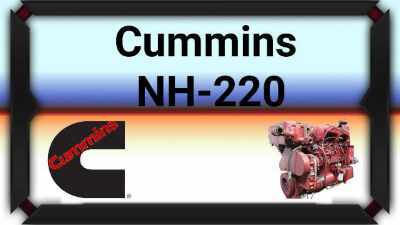 This mod adds a 1959 Cummins NH-220 engine to the game! The NH-220 is a 12 litre, naturally aspirated engine (no turbo, no supercharger) from 1959 which produces 220HP (164kW) and 606lb-ft (821Nm) of torque. There were versions of this engine made later which had either a turbocharger (NH-262) or a supercharger (NHS-275), but this mod only adds the 220. The NH-220 was found in trucks, heavy equipment, marine, and as a generator. This engine was originally known as the NHB-600 and made only 200HP, but in 1959 Cummins had it producing 220HP and decided that was enough to justify renaming it. Maximum tow capacity is going to be in the area of 50,000lbs, but is somewhat reduced with a steep enough grade. You will find four horsepower options for this engine in all vanilla trucks and many modded ones too. The first one is based on official specs (as best as I could find), outputs realistic power for this engine. I highly recommend you try this version out. The next three versions are made-up and never really existed. These are here for people who like the way the engine sounds but don’t want to give up the power they are used to. This mod also includes a Spicer 18 speed compound transmission. This is made up of a 6-speed PSO140-6A main box and a 4-speed AMO1750-4D auxiliary transmission with Low, Under, Direct, and Overdrive gears. So because of the lack of turbo, the NH-220’s peak torque and horsepower are at a pretty high RPM, but the power band is also quite wide. It makes peak torque from about 1300rpm all the way up to about 1700rpm, and max horsepower at the redline: 2100rpm. Operating range will mostly be about 1400 – 1850rpm on level roads, but if you’ve got extra weight or are on a steep grade you’ll want to add about 250 RPM to both of those numbers. This is very different from most engines in this game where you rarely exceed 1500. Basically, you’re going to want to rev the snot out of this engine. This engine used to come in trucks that had two transmissions for 16 total gears. My recommendation is that you do take a 10, 13, or 18 speed. Don’t take something with fewer gears unless you’re using one of the higher horsepower versions. Your horsepower curve really favors the top end, so you need something with enough gears that you aren’t dropping to 1000rpm after a shift.